The Professional Regulatory Authority for Advertising has just published the 7th version of the ethical rules for advertising and claims relating to cosmetic products. The text has been revised to adapt to the European Cosmetics Regulation which came into force on 11 July 2013 with its part on common criteria concerning claims, as well as to the Advertising and Commercial Communication Charter of Cosmetics Europe. It also takes into account the abolition of the French PP visa. This 7th amendment to the Cosmetic Products Recommendation mainly concerns 4 points, introducing in particular new requirements applicable to advertising illustrations and claims concerning products previously covered by a PP visa. This new paragraph is inserted in the chapter devoted to the presentation of a product's performance. It states: a/ Digital techniques can be used to enhance the beauty of images to communicate brand personality and positioning and/or any specific product benefits. b/ However, the illustration of a product's performance must not be misleading: - Digital techniques shall not alter the images of the models in such a way that their shapes or characteristics become misleading as to the result that can be achieved by the product. - Pre- and post-production techniques are acceptable as long as they do not give the impression that the product has features or functions that it does not have. For example, the following cases are not considered misleading: exaggeration or stylized beauty images that are not meant to be considered literally, techniques that enhance the beauty of images and are independent of the advertised product or effect. The PP visa, this very French particularity, concerned the products, except drugs, sold to the public without prescription and claiming a benefit for health, which was the case of the care intended for acneic skins and oral hygiene products claiming an action of prevention of the caries or the reduction of the inflammatory state of the gums. Not falling within the framework of the new Cosmetics Regulation 1223/2009, it has become obsolete since 11 July 2013. The ARPP has therefore added to the Recommendation a reminder of the claims falling within the definition of cosmetic products for the two categories concerned. - Claims relating to the treatment or prevention of acne (e.g. anti-acne, acne), the treatment or prevention of papules, pustules, cysts and microcysts and the endocrine action on sebum production are prohibited. - Other claims are possible provided they are justified by scientific evidence. - Claims relating to the treatment of dental caries or gingivitis (e.g. reduction of inflammation or gingival bleeding) are prohibited. - Claims related to the prevention of dental caries, or the prevention or reduction of occasional bleeding or gum inflammation are possible. In this 7th revision, the rules relating to sureties have been relaxed. They now read as follows: a/ A recommendation, made by a member(s) of a medical, paramedical or scientific profession, may apply to an ingredient, product or general hygiene or beauty message, provided that it is based on objective and verifiable evidence and does not reflect only the personal opinion of the professional(s) represented. b/ When the recommendation comes from a professional linked to the company promoting the product, this link must be clearly announced in the advertising message. c/ The professional, if appointed, must have a real physical existence nevertheless the call to an actor to represent him is possible. d/ These messages must not give rise to confusion for the consumer between a cosmetic product and a medicinal product. In particular, the following passage, which existed in the latest version of the Recommendation, has been deleted: "Generic formulae such as"clinically proven effective","medically tested","developed after clinical trial" and not attached to a physician, scientist or group of them, are not considered as sureties". It should be noted that the necessary justification for this type of allegation has been made explicit in the Guidelines published in July 2013 to accompany the Common Criteria. Finally, the rules relating to the mechanism of action, originally included in the paragraph concerning anti-wrinkle products, have been generalised: they are now included in the paragraph entitled"General principles". As a reminder: it is possible to refer to the mechanism of action of the product or its ingredients if this mechanism is based on objective evidence and if the main claim of the product clearly relates to a visible cosmetic benefit. 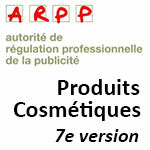 This 7th version of the Cosmetic Products Recommendation is applicable by 15 January 2014 at the latest. They were expected, they were already known in broad outline and were confirmed by Regulation 655/2013 “laying down Common Criteria for the justification of claims used in relation to cosmetic products”, dated 10 July 2013 and applicable as from 11 July. Reminder of the principles. We knew the main lines: they are now official and guidelines. In parallel with Regulation 655/2013 on Common Criteria regulating the use of cosmetic claims, the European Commission has published a guide for their implementation. With examples and details of some terms. Dec. 10, 2018 Cosmetics: don't rely on the claim "Not tested on animals"! March 27, 2017 Devices for hair removal and lipolysis: toward a more stringent regulation?